Just days after being charged by federal prosecutors, Rev. 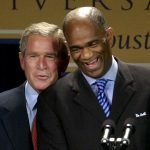 Kirbyjon Caldwell, Houston megachurch pastor and longtime spiritual adviser to former President George W. Bush, took to the alter of his church on Easter Sunday to defend himself. According to KHOU11, Cadwell told his parishioners that the indictments against him were just a “pit stop” on his way to the Promised Land. Caldwell, 64, who pastors Windsor Village United Methodist Church, was indicted in federal court last Thursday for allegedly using his influence as pastor of the 16,000-member megachurch to lure “vulnerable and elderly” investors into a scheme that has seen them lose over $1 million. Gregory Alan Smth, 55, manager of Shreveport, Louisiana-based Smith Financial, was also named in the indictment for allegedly using his influence to lure investors to pay more than $1 million to invest in historical Chinese bonds. Both of them now face 13 counts of wire fraud, conspiracy, and money laundering charges, prosecutors said in a news release. The Securities and Exchange Commission, which is also suing both men for violating financial laws, said that in 2013 and 2014, Smith, who has been barred from the broker-dealer business by the Financial Industry Regulatory Authority since 2010, along with Caldwell, allegedly targeted “vulnerable and elderly” investors, giving them false assurances that the bonds–which were “essentially worthless” with no meaningful investment value–were worth millions. Prosecutors said the historical bonds were issued by the former Republic of China prior to losing power to the Communist government in 1949. Smith allegedly told some investors that the money raised would be used to acquire more Chinese bonds. Prosecutors said he repeatedly told investors that the bonds were “risk-free,” “guaranteed,” and “safe” and that there were buyers lined up to purchase the bonds. Smith also told investors that the bonds would either be sold to a third party or redeemed by the Chinese government. “They are not recognized by China’s current government and have no investment value,” United States Attorney Alexander C. Van Hook said in the release. Prosecutors said Smith and Caldwell promised high rates of return, sometimes three to 15 times the value of the investments. And instead of investing the funds, prosecutors said they allegedly used the approximately $1.8 million of investor money to pay off personal expenses including personal loans, credit card bills, mortgage payments in the case of Caldwell, and luxury vehicle automobiles in the case of Smith. Prosecutors said offshore individuals allegedly received most of the remaining funds. Caldwell and Smith allegedly raised at least $3.4 million from 29 elderly investors, some of whom liquidated their annuities to invest in the scheme. Cogdell said his client believed the bonds were legitimate and that he had invested a significant sum of his own personal money into the scheme. “Everyone who has asked for their money back, because the process is taking longer than expected, has received their money back,” Caldwell said during services on Sunday. Caldwell started his career as an investment banker and bond broker. He has pastored Windsor Village Church since 1982, growing the congregation from 25 people to the nearly 16,000 members it is today, according to the church’s website. Caldwell served as former President George W. Bush’s closest spiritual adviser and officiated the wedding for his daughter Jenna in 2008. He endorsed presidential candidate Barack Obama that same year, donated to his political campaign, and went on to become one of President Obama’s spiritual advisers. He has launched various community development projects in the Houston area, including schools, an AIDS outreach center, and a nutrition program. He published The Gospel of Good Success: A Road Map to Spiritual, Emotional and Financial Wholeness in 1999, in which he discusses how he transformed his megachurch into a “Kingdom-building machine” and advises readers on how to “create wealth God’s way,” among other things.